Whenever there is a disruption in your life, it can feel overwhelming, especially when that water damage affects your home or business in a way that requires you to seek out professional restoration assistance. 911 Restoration of East Dallas is sensitive to the fact that when customers call in need of flood damage cleanup, mold removal services, or fire damage restoration, they are in a vulnerable place and need to talk to someone who understands their wants and needs. The flood repair technicians’ in Dallas’ top priority is to reassure you that from the moment you contact them you will be surrounded by a team that will handle every aspect of the restoration job. We are available 24/7/365 to provide comprehensive services, meaning that we can handle everything from fixing a water leak in the ceiling and cleaning up after a toilet flood to providing fire damage restoration and mold removal services. The water damage technicians in Dallas never want to make you wait for help when you are in the midst of a water damage emergency, which is why we guarantee to arrive within 45 minutes of receiving your call. Call 911 Restoration of East Dallas when you need the help of a disaster cleanup company that will provide you with the peace mind you deserve throughout the entire remediation process. Our water damage professionals service all of greater Dallas and surroundings including the neighborhoods of Garland, Mesquite, Richardson, and Allen, TX. Property owners in East Dallas deserve to have access to the best water damage restoration company that genuinely understands your needs. 911 Restoration of East Dallas is locally owned and operated by Eric, a long time resident so rest assured we will handle your property as it were our own. 911 Restoration of East Dallas technicians are IICRC certified in water damage restoration. Have peace of mind that our water extraction experts have the proper training and experience to deliver quality water restoration services that you require at all hours of the day. Even though most of the year is generally warm, with hot, humid summers, the winter can expose just how unprepared property owner are when it comes to dealing with the cold weather. This drop in temperature can lead to frozen pipes and pipe bursts, which can cause basement floods and other types of water damage throughout that property. A broken water pipe requires speedy water damage repair because the longer the water damage sits in your property, the more costly issues will arise. The increased moisture can rot drywall, cause mold to grow, and ruin your possessions, but by receiving prompt water extraction services from our Dallas flood cleanup pros, you can save yourself a lot of time and money. Call our water damage restoration professionals when you need immediate flooding repair and water mitigation services, and we will present you with the water damage help you need to get your life back to normal again. The high humidity levels and hot climate that East Dallas experiences in the summer make it easy for mold infestations to run rampant throughout the community. 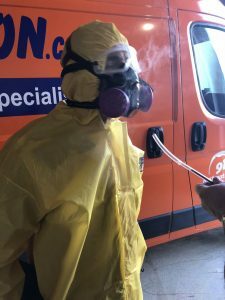 The mold removal professionals understand how quickly these infestations can occur and handle these situations by being meticulous with their remediation approach. It only takes 24 hours for mold to begin to sprout, which is why it is crucial for property owners to reach out to the mold removal specialists as soon as they notice any sign of an infestation beginning to grow. Mold in Dallas can move behind walls and other areas of a property, as long as the conditions are right, so although you may only see a few spots in one section of your home, there may be a mold colony living in an entirely different area. The mold removal in Dallas technicians take the time to administer a thorough mold inspection when they are on the job, ensuring that every spore is extracted and your property is left wholly decontaminated. More often than not, mold comes from water damage, and to complete a successful mold removal job, the house’s flooding issues or ceiling leak also need to be repaired. Property owners can count on the Dallas mold removal professionals to take care of everything causing the infestation, including the water damage restoration. So, call 911 Restoration of East Dallas to work with mold experts that you can trust today. When a fire occurs, even if it starts in a confined space, it can engulf an entire structure within five minutes of ignition. The destruction that can take place during this time can be monumental and often requires professional fire damage restoration assistance. Even a small kitchen fire can spread smoke, soot, and ash throughout an entire home or business, not to mention the water damage that is created during the extinguishing process. The fire damage cleanup unit can provide smoke, odor, and stain removal, along with making any flood repairs that need to take place. Once this soot and ash land on fabrics, carpets and other porous surfaces, it can significantly affect the odor within the property. By using special cleaning agents, our professionals can get rid of the foul, smokey smell, as well as the smoke stains. When the repair technicians take on a project, they do so knowing how taxing these situations can be for their customers, and that is why they go the extra mile to make the process as easy for you as possible. So, call the fire damage restoration team as soon as the fire department puts out the flames, and we will begin putting the pieces of your property back together again. A sewage backup spill inside of your home or business is not only a big disruption, but it creates a biohazard that is not safe for you or anyone else to be around. Sewage is also known as black water, and it is a category three water due to its high toxicity levels. The black water is filled with bacteria and waste material that is unsafe to be around, which is the main reason why you should never attempt a cleanup on your own. By hiring the sewage cleanup crew in East Dallas, you can be confident in their ability to decontaminate your property safely. Technicians wear hazmat gear, suits, masks, and respirators to extract the black water and sanitize the area. Black water can also be a prime source for mold growth, so to prevent an infestation from occurring, the sewage cleanup team will arrive quickly to implement the necessary water damage restoration services. There is no time to waste when it comes to cleaning up a sewage backup. Call 911 Restoration of East Dallas immediately after discovering the black water overflow, and before you know it, your property will be looking and smelling fresh and clean. Both natural and man-made disasters can erupt at any time, and when it does, the disaster restoration team is ready to spring into action. Whether the damage is caused by an earthquake, water heater explosion, or grease fire, the team at 911 Restoration of East Dallas is prepared to provide you with the services needed to fix up your property thoroughly. Often, one issue triggers a series of events that causes a water damage disaster situation in Dallas. An earthquake may disrupt faulty electrical wires and cause a fire to break out in your building. Or a tornado may rip the roof off your house and cause rain to introduce massive water damages to your home’s interior. Whether you need fire damage restoration, water damage cleanup, or structural repair services, you can count on the technicians in East Dallas to fully recover your property. All of the repair techs have been trained in administering all forms of disaster restoration services, so no matter what kind of disaster occurs your property, the fire damage restoration team can prevent the damage from getting worse, or in some cases, from happening in the first place. Let 911 Restoration of East Dallas support you through this tumultuous time. Contact our experts right away, and we will turn your property disaster into a fresh start. 911 Restoration of East Dallas experts gladly services water damage restoration, mold removal, and fire damage restoration in Dallas, Mesquite, Allen. Garland and surrounding areas.